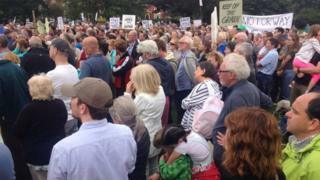 More than 2,000 people have attended a protest rally against plans to expand a roundabout on to moorland. Newcastle City Council is considering enlarging the Blue House roundabout near Gosforth, which would involve laying road on two surrounding moors. Protesters described the plans as "overkill" and a "monstrosity". The council said the roundabout was the worst in the city for causing injuries and it had a responsibility to make it safer. A spokesman said: "Making changes at a location like this inevitably requires difficult decisions." Henry Gallagher, the Liberal Democrat councillor for East Gosforth on Newcastle City Council, was one of those who organised the protest. He said: "The strength of feeling against these plans was clear to see and I really hope the council takes notice. "We accept the roundabout needs improving but this plan is absolute overkill, surely there must be another plan which sits within the footprint of the existing junction. "This is a popular recreation area and while there would still be some green area left it would be right next to this monstrosity of a junction, we would basically have a motorway on the moor."